A slight increase for global PV power capacity in 2014 (Image courtesy of Shutterstock). 70 MW Photovoltaic Power Plant in Chile. The feed-in tariff reduction in most of the traditional markets, especially in Europe, and regulatory changes had a considerable impact on the growth of PV industries and markets in 2014. We are facing a change in the regulatory approaches in emerging markets such as America, Middle East, China or even Chile. New opportunities in emerging markets have helped to reduce costs and increase attractiveness of PV, even in regions where electricity generation from renewable sources are non-subsidized. The newly installed global PV power capacity reached 39 GW in 2014, which represents a slightly higher value than in 2013, by only 8% (36 GW). This annual percentage increase was not as pronounced as in previous years, such as in 2013 where the increase in installed capacity worldwide was 23% above the 2012 value. As in the prior year, in 2014 Asia led the PV sector with approximately 22.87 GW of installed capacity. This deviates from the trend of previous years, 2012 and 2011, where Europe was the prevalent market in the PV sector. In fact, in 2014 the Asian PV market represents more than half of the total market, around 58%, in terms of installed capacity worldwide. The European market is the second largest market with approximately 19% of the total market, followed by North America with 17%, and Oceania with approximately 2%. In 2014, Europe installed about 4 GW less than 2013, continuing the trend of 2013 where it could be observed that growth in the European market has decreased. In all other regions the installed capacity has increased compared to 2013. Compared to installed capacity in 2013, South America increased by about 20 times, and Africa increase by around 7 times in 2014. The major markets in Europe in 2014 were UK (2.44 GW), Germany (1.90 GW), France (0.98 GW), Romania (0.46 GW) and Italy (0.39 GW) making 81% of the total newly installed European capacity. In Asia, China and Japan top the ranking far above the other countries with 10.60 GW and Japan 9.66 GW, respectively, followed by South Korea (0.92 GW) and India (0.79 GW). These countries represent 96% of newly total installed PV capacity in Asia. The major market in North America is the United States (6.20 GW), which together with Canada (0.50 GW) make the 98% on total newly installed capacity in North America. In both Oceania and Africa there are clear leaders. In Oceania this leader is Australia with 0.88 GW (corresponding to 98% of total installed capacity), and in Africa it is South Africa with 0.77 GW (corresponding to 95% of total installed capacity). Figure 1. Summary of the global PV power market in 2014. In previous years the traditional markets have been the European markets, in particular Germany, France, UK, Italy, Romania, and Spain. Germany has seen a strong reduction of new PV installations, installing in 2014 about half of the capacity installed in 2013. This was caused by a change in the Feed-in-Tariff (FiT) mechanism, which resulted in a decrease of the FiT. Accordingly, the plants connected within January 2014 up to 1 MWp, received 0.1158 €/kWh, while up to 10 MWp, 0.0947 €/kWh and plants connected within December 2014 up to 1 MWp, received 0.1095 €/kWh, while up to 10 MWp, 0.0872 €/kWh . Within Europe the UK market represents the greatest growth, installing in 2014 more than double that in 2013, and leading Europe in most newly installed capacity. The UK solar PV market has grown to this point thanks to the Renewable Obligation (RO) policy. The objective of the policy is to encourage the development of large scale renewable energy projects. The policy works with the issue of Renewables Obligation Certificates (ROC) to the electricity generators depending on how much energy they have generated from renewable sources. At this point, generators can sell the ROC for which they will receive an extra payment, apart from the electricity price. The amount of ROCs per MW that would be needed for suppliers to meet their targets has been decreasing in the past years. For the 2014/15 period the number of ROCs was 0.244 ROCs per MWh in England, Scotland and Wales, and 0.107 ROCs per MWh in Northern Ireland. In 2014, the Italian market showed another strong reduction in operating PV plants. 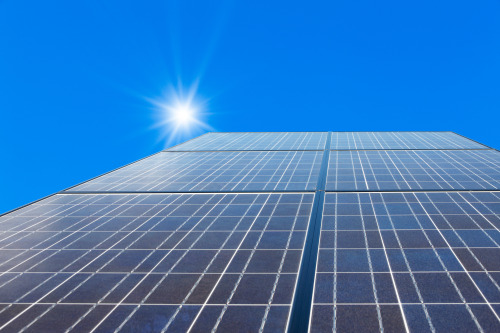 In June 2014, the Italian Parliament approved a retroactive law by either a reduction of 8% on the applicable feed-in-tariff rates for photovoltaic plants with a nominal power exceeding 200 kW, or a tariff reduction of between 17-25% against an extension of the payment period by four years. On the other hand, for new installations, GSE (Gestore Servizi Energetici) officially announced the stop of the incentive after its cap of 6,700 million euro was reached and therefore the cut of the subsidies by the government. The French solar market had an increase of 45% compared to the previous year. Since 2011 France has had a regulated feed in tariff, which is revised every 3 months taking into account technology cost reductions. During the first quarter of 2014 the tariff for ground mounted installations up to 12 MW has been 0.0736 €/kWh. Romania was the fourth largest market in Europe for newly installed capacity in 2014. Still, the newly installed capacity was lower than that in 2013. One reason was due to the reduction in incentives. The Romanian system is based on a quota system for which developers acquire green certificates for every megawatt generated up to a period of 15 years. Afterwards, each certificate could be traded on a spot market. From January 2014 the number of green certificates was decreased from six to three. Until last year the photovoltaic market in Greece has been one of the most important traditional markets in Europe. During 2014 the Greek market suffered a dramatic decline. In 2013 over 1 GW was installed in Greece decreasing this number down to 13 MW during 2014. Within these 13 MW, 11 MW came from ground mounted systems and 2 MW from rooftop installations. This drastic drop is mainly caused by the 2012 suspension of the approval process for photovoltaic systems and the financial crisis that is plaguing Greece. As in 2013, China was the top market last year with 10.6 GW of newly installed capacity. It can be observed that China continues a similar trend in terms of installed capacity ranges as in 2013 when 11.3 GW were installed. Chinese government expectation for 2014 was even higher, at 14 GW. One of the reasons why the installed capacity in 2013 was greater could be due to the fact that the tariff in force in 2013 (for large-scale plants, and based on the radiation level at the locations, 0.9 yuan/kWh (€ 0.102/kWh). 1 yuan/kWh (€ 0.117/kWh)) was assigned to projects connected until 1 January 2014, and therefore this deadline created a rush at the end of the year. This was previously observed in other markets such as Germany or Spain. This massive growth was driven mostly by the generous feed-in tariff for both utility-scale as well as distributed generation installations (roof tops and residential installation). The objective of reaching 35 GW by 2015 will likely be achieved and China is now targeting 100 GW by 2020. Despite all this, in China the electricity generated by solar energy still does not exceed 1% of the total energy consumption. It is expected that China may become an established market in the short term. Japan continues as second in terms of newly installed capacity worldwide in 2014, and also in the second position of accumulated capacity in the Asian market. After the introduction of the aggressive FiT, newly installed PV plants grew at an impressive rate. Japan has an accumulated capacity in 2014 of over 23 GW where roughly 70% of the installed capacity is utility and commercial installations and only 30% residential installations. In 2014 South Korea contributed to PV growth in Asia, installing 0.92 GW of PV capacity, reaching third place in Asia, surpassing India who held the position in 2013. The incorporation of national programs has helped generate growth in newly installed capacity in the country, with some noteworthy programs: The Renewable Portfolio Standards (v2012-2022) which mandates electrical utilities to have a portion of their generation from renewable energies (over 500 MW), and the Home Subsidy Program (One Million Green Homes, v2004-2020) which was merged with the existing 100,000 rooftop PV system installation program and for which the government supports some of installation cost (household < 3kW). The United States installed (6.20 GW) more than the 30% new capacity in 2013 (4.75 GW). More than one third of all accumulated installed capacity in the US was installed in 2014. An average of 1,300 MW per quarter was installed during the first three quarters; this rate increased in the fourth quarter installing approximately 2.20 GW. For 2015 a similar growth is expected, predicted to reach 8.1 GW of newly installed capacity which corresponds to an increase of 31% compared to 2014. Most of this growth is still projected to come from the residential segment, the remaining from non-residential and utility section. Due to its renewables IPP programme South Africa has seen the installation of 775 MW of new PV capacity during 2014. This value represents a large increase of installed capacity compared to the value of 2013 (75 MW). The increase is due to the IPP Programme that has started showing results. The PV mass market for residential and medium sized commercial applications has not officially started, but considering the countries huge solar potential and constraints in the power system, massive growth of PV plant installations is expected in the coming years. In addition, it is expected that South Africa might pass over the 1 GW barrier of installed capacity during the year. 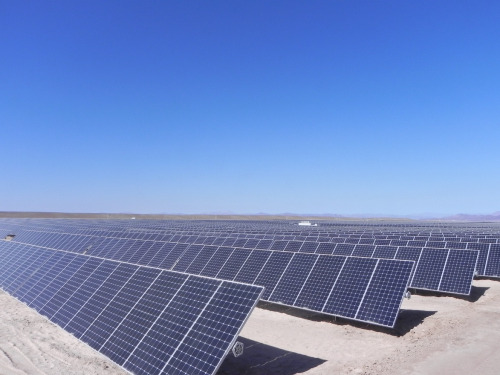 Chile has installed 359 MW new capacity during 2014, being the top country within Latin America. Additionally, it is seen as one of the emerging PV markets for the next years. Even though the electricity price for renewable generation is non-subsidized, high solar irradiation in areas of Chile, especially the north, and rising demand make this market attractive for large scale PV plants. Looking beyond the bare installation numbers, it can be observed that solar PV is starting to play a substantial role in electricity generation in some countries, particularly in Europe with its large installation base, while lower prices and movement away from feed-in-tariff have opened new markets from Africa and the Middle East to Asia and Latin America. The three biggest projects of 2014 are located in the United States, around the same area of the country. This trend will continue in the following year as two projects of 579 MW and 550 MW are scheduled for completion in 2015. The two largest projects completed during 2014 were installed by the company First Solar with CdTe PV panel technology. Topaz Solar Farm started construction in 2012 and has been gradually commissioned from February 2013 through November 2014 when it was finalized with 550 MWp. The Project is expected to feed 1,100 GWh of electricity into the grid per year. Agua Caliente, with a capacity of 290 MWp, was also completed in 2014. The project is expected to feed 626 GWh into the grid per year. Figure 2. Major PV projects commissioned in 2014. As in 2013, module prices experienced stabilization, production costs decreased and solar cell efficiency was slightly improved. The top 10 PV module suppliers in 2014 have not changed from 2013, except for one new supplier that enter the list, SunPower. The top ten companies alone delivered 49% of the newly installed capacity in 2014. Asian companies, especially Chinese, are leading the market and 8 of the top 10 companies are based in China or Japan. The remaining two are companies from USA, First Solar (eighth position) and SunPower (tenth position), which reflects the growth of US PV market worldwide. The concentrated photovoltaic (CPV) technology still remains small compared to the conventional PV market. It has been a year of technology improving with record efficiencies for modules (36.7%) and cells (46%) published by Fraunhofer ISE. In 2014 a total number of 7 large scale CPV projects where completed totalling 66.5 MW compared with the 92.5 MW installed during 2013. The projects installed during 2014 are located in South Africa, USA, Portugal and Saudi Arabia. The global PV panel industry has observed significant cost reductions during the 3 years before 2012 mainly due to competition, economies of scale, and technological and manufacturing advances. During 2012, module prices decreased, and in 2013 and 2014 they remained quite stable over the year with only a slight decrease in price. The PV inverter market saw the same trend as the module market since 2009 when Asian manufacturers gained higher market shares. In 2014 companies from China and Japan had 50% of the global supply of inverters. Four companies from China and Japan are in the top 10 PV inverter supplier list of 2014. The global leader is again SMA, followed by Omron and ABB which included Power One. The decline of the PV market in Europe and the shift of focus for cost saving gains away from modules to the rest of the BoS, has directly impacted European inverter suppliers. ABB’s position in second was replaced by Omron. In the last two years ABB’s revenue has dropped by more than half, and many of leading names from the last five years are no longer in the top 10 ranking list. Amanda Tormo Herrerias is Solar Power Expert at Lahmeyer International GmbH, Bad Vilbel. Thomas Klinge is Head of Department Renewable Energies at Lahmeyer International GmbH, Bad Vilbel.